The future of journalism and democracy lies in news and analysis that reflects the interests of ordinary people, says John Passant. MARK COLVIN once interviewed me about a tax matter for an item on PM on ABC Radio. He was knowledgeable and a delight to deal with. When the item went to air, he apologised for editing it down. I suspect it was his polite way of telling me I waffled. His death has provoked an outpouring of love and respect from those who knew him — in the media, politics and elsewhere. I understand where that comes from. A tribute to Mark Colvin @ABCthedrum. However ... yes, he was good at his job. Yes, he was erudite. And yes, he was a lovely man. The problem is not so much these qualities but the fact that he was seemingly such a rare gem among the mainstream media. Why aren’t more journos like him? There is something else as well — he was objective. He was even-handed in dealing with the various political expressions of capitalism. Like all the other mainstream media journalists, he did not imagine any alternative to the current exploitative system in which capital expropriates the wealth workers create. It isn’t that journalists or some of them secretly harbour revolutionary socialist ideas and put the blow torch to the belly of politicians to expose the real nature of capitalism. Mainstream journalists are deaf to the gasping of the old system and the eupnoea of the new. There is no surprise in this. The mainstream media is an expression of capitalist relations. Journalists – other than the exceptionally well-paid ones – are workers who, at best, will have ideas about reform. Such debate and disagreement as occurs are the way forward for capitalism, not its overthrow. Most of the media is not even about these debates, it is entertainment to distract us from the reality of our systemically alienated lives. Commercial TV "analysis", sport, "bash 'n crash", kitchen crap, home renovations, Eurovision... you name it. 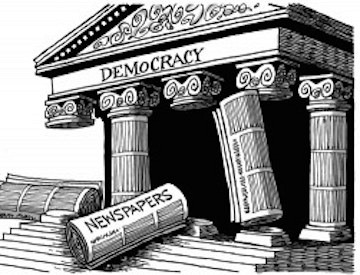 One argument that supporters of the mainstream media repeat ad nauseam is that a free press is vital to our democracy. There is some truth to this. Dictatorships stifle independent and critical media and journalists. But so too do democracies. What happens when individuals release material that exposes our rulers? After seven years in gaol, Chelsea Manning will be released on Wednesday. Julian Assange is still holed up in the Ecuadorean Embassy in London. Donald Trump has threatened sacked FBI director James Comey with the release of tapes (which may or may not exist) to silence him. "Entrusted persons" (such as doctors, teachers and nurses) are liable to two years imprisonment for revealing the truth about their work and the conditions in the concentration camps on Manus and Nauru. Journalists (other than Murdoch hack Chris Kenny) are denied visas to enter the camps. Oh, I can hear some argue, investigative journalism has done some good things. Tony Jones and Four Corners investigated child abuse in the Northern Territory. But it was typical "do-gooder" justification which enabled the continuing genocide of Aboriginal people. It was also wrong. Then there is Don Dale. Yes, the ABC revelations were shocking. But what the Royal Commission won’t do is examine the genocide of Indigenous people as the real cause of the problems and certainly won’t suggest answers that address that — such as sovereignty, paying the rent and a treaty. Our media reflect the blindness of white settler society to genocide. There was one government inquiry that did actually mention the word "genocide". It was the investigation into the Stolen Generations of Aboriginal people, The Bringing Them Home Report. Politicians and most of the media disavowed him. Parliament spent 30 minutes on the report. Genocide is the truth that dares not speak its name. To acknowledge it would challenge the founding myths of a "united" Australia. The genocide continues unabated today. Oh... and not to forget the Royal Commission into Aboriginal Deaths in Custody. Black deaths in custody are higher now than when that report was handed down. It is not just the genocide that the mainstream media in Australia ignores. It deals only with the surface explanations of how capitalism works. It cannot countenance the idea (an insight I accept as a reality) that profit is the unpaid labour of workers. It ignores the systemic drivers towards economic crisis, especially the tendency of the rate of profit to fall, which is inherent in the way capitalism is organised. One media event did challenge business as usual. It was the recent seven-day "illegal" Fairfax strike in response to management’s proposal to cut editorial staff from 500 to 375. Management is responding to market conditions — namely the greater use of free online outlets for news and opinion and the seeming fall in interest among younger people for newspapers. The advertising rivers of gold in the hard copy editions have dried up. The underlying problem is that everything is a commodity and technology now offers a way to decommodify news and opinion. Is there an alternative? The strike to defend Fairfax jobs was a good start, but in a world of constant revolution for profit and hence constant job losses, the pressure on mainstream media to do more crap with fewer quality journalists will be unbearable. Online media, like Independent Australia, offer some sort of alternative. Where else could journalism from below of the calibre of Martin Hirst’s wonderfully written and subtle class analysis of the 2017 Budget or his gender impact reporting of the same document find an outlet? However, ultimately the future of journalism lies not in looking to Fairfax management for answers, or to a rich sugar daddy like Rupert to pump in millions to prop up loss-making paper The Australian, but in the democratisation of society and the production of news and analysis that reflects the interests of ordinary people — not billionaires. That means a society in which workers, including journalists, work to satisfy human need, not to make a profit for the one per cent. Support free speech. Subscribe to IA today.